Product prices and availability are accurate as of 2019-04-20 00:48:32 UTC and are subject to change. Any price and availability information displayed on http://www.amazon.com/ at the time of purchase will apply to the purchase of this product. 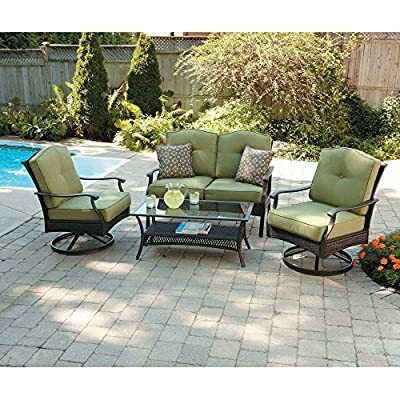 Relax and appreciate sunny weather in the comfort of the Better Homes and Gardens Providence 4-Piece Patio Conversation Set. The set comes with a table, two chairs and a loveseat. The sturdy Steel construction with powder-coated finish and all-weather Wicker ensures a fresh appearance. The chairs and loveseat come with UV-protected cushions, and the loveseat comes with two accent pillows for extra comfort. The tempered smoked Glass table top is easy to clean and maintain. This set will add a touch of vintage elegance to your deck or patio. Coordinating Better Homes and Gardens Providence collection pieces (sold separately) are available.